Hello! Welcome to Body Moments ~ In the Moment with the Occipital Area! In the Moment with your Body! What is the occipital area, you say? For those of you unfamiliar with the medical term, the occipital bone is the bone at the back of your head that forms the base of your skull. The occipital bone covers and protects that area of the brain that allows us to see. It provides us with vision. This area of "sight" is not to go unnoticed, as we shall see. The occipital area that we will focus on today is that area at the base of your skull where your head meets your neck. It is a highly emotional area that is the source of many a headache or stiff neck. If you want to shift toward wholeness and health when it comes to your occipital area, one filled with tensions from everyday life, please, spend a few mindful moments with your body now, and encourage the shift toward peace and healing. Neutral position on foam roller, with head extended over the edge, just below skull bone. You may not be able to tell that my head is over the edge, with all that silver hair in the way, but it is! Yes, I am "going gray!" At first I thought "whoa!" Then I played with it and found that it was a great experience to relieve tension in the back of my head and neck! As a result, I just had to share it with my readers. Here is how you do the body moment: Start in the neutral position as shown above. Take a moment to center yourself here, and turn your attention to your breath. Begin to breathe deeply, for several breaths. 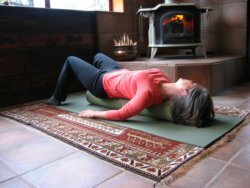 Then, when you are ready, gently roll your head from side to side, creating a pressure with your head against the edge of the foam roller as you roll. This movement will give you a self-massage along the base of your skull. You may have to adjust your position a bit until you find that exact "sweet" spot. Try moving your body up a bit or down a bit on the foam roller as you find just the right pressure from your head to the edge of the foam roller. Some areas may feel great as you roll and another may be very sore. Right position on foam roller, with head extended over the edge, just below skull bone. Left position on foam roller, with head extended over the edge, just below skull bone. As you find the sore spots, or the "sweet spots" that feel really good with the pressure, stay on that spot for awhile. Sink into that spot and breathe deeply. Feel the soreness and tension release. Stay there as long as your heart desires. This area holds a lot of anger and tension and "shortsightedness." There are three areas on the base of the skull that are acupressure points. One in the center at the base of your skull and one on each side about 2 finger widths away from the center, also at the base of the skull. When you roll you head back and forth on your foam roller, pressing into these areas, you are working your acupressure points. That is why this body moment exercise is so effective! In Chinese medicine, the center acupressure point at the base of your skull is a pressure point for achieving great spiritual clarity! You may wish to meditate on seeing clearly when you stop at this area. Seeing more than one point of view is the main theme of this area. If you neck is stiff, do you only see one point of view? Do you only fix your gaze forward? Is your gaze stuck in one side or another? 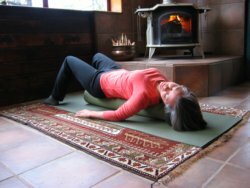 When you breathe and roll, you may wish to say, "My gaze moves in all directions!" "I see all points of view." "I release my anger and my rigidity!" "I seek clarity in all things!" 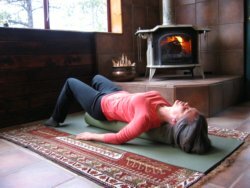 By rolling your head on your foam roller in this manner, you are also giving yourself what massage therapists call a cross-frictional massage of the muscles of the neck. Cross friction is created by massaging the muscle from side to side instead of along its length. You will get a double effect when you do this body moment exercise; self massage and an acupressure treatment! All with a lowly foam roller! See why I love it so much? If you can repeat this body moment exercise as much as possible in the coming month you will ease into your new sense of clarity. The more you practice this, the easier it will become and the more you will release your anger, rigidity and shortsightedness. With each body moment that you learn your new sensation of "sight," you will learn the skill for actual events in your life. Then when you feel territorial or uncontrollable anger or when you are shortsighted you can apply those skills!